It’s the start of February. We have been busy since December, and finally Ink Stains is back on the digital realm of The Daily You. Just so you know, my travel company Stamps Travel & Tours has finally launched in the world wide web. I am excited to share our tour packages in the Philippines and abroad. Together with TDY, we also brought to existence our Philosophical Tours which aim to bring our mentees to selected parts of the country while we help them find their purpose. We’ll talk about it very soon. It will surely be an exciting year ahead. We have been putting together our strategies for 2017. It’s simply amazing that the things that we have been talking about in 2016 will finally be actualized this year. There are so many works to do, but with you, we know that we can make it happen. As we all know, February is the month of love. Actually, everyday must be a celebration of love. With this month taking on the spotlight, I would like to share some nuggets of wisdom that I gained through various life experiences. Love is a wonderful thing. Love makes us gush, flickers inspiration, and brings out the best in us. Time and depth are two of the important components of love. We cannot say that we truly love someone unless we have helped them go through their worst battles, dealt with their weirdness, accepted them for all that they are, and turned (98%) unconditional. Saying the words “I love you” is easy. The challenge is how we prove it. We can be mesmerized by so many good-looking faces, charming smiles, and radiant personalities. At the end of the day, we will always seek for the one that makes us feel home. It’s easy to fall into the trick of attraction. Real love is beyond the flesh. Real love is all about the soul. It’s something that tugs you back together when you think that you’re better off with someone who is so ideal. Real love speaks a language that no one can hear, except for the both of you. Call it too romantic, but there is always somebody for someone. Before we tickle our heart with the idea of romance, remember that love is universal. It starts with the love of God, the truest and most profound of all. Next is the love of our family, the first set of people who nourished us in so many way. As we grow old, we meet friends and experience nature, hence the love for such must never be compromised. Of course we have ourselves which we must love truly, madly, and deeply. Failure to love ourselves will lead to unhealthy relationships because we will only turn insatiable thinking that their perfection is the only thing that will fill us. No, work on your wholeness as an individual before extending the love. This way, loving becomes extra meaningful. For this month, I would like to expand my heart so I can radiate more love. Understanding is a solid manifestation of love. If you have the capacity to understand, then be the one to. Care a little bit more. Listen a little bit more. Be present a little bit more. Pure love is an act of service. It’s not the blush from your crush (which actually we girls experience a lot), but it’s the certainty and assurance that you feel in your heart. It’s where you can be yourself. It’s where you can talk about anything. It’s where you will choose to be. It’s where you feel free. It’s what you always talk about. It’s where the Heavens always lead you. It’s THAT home. Lali Singson is the Co-Founder and President of TDY. 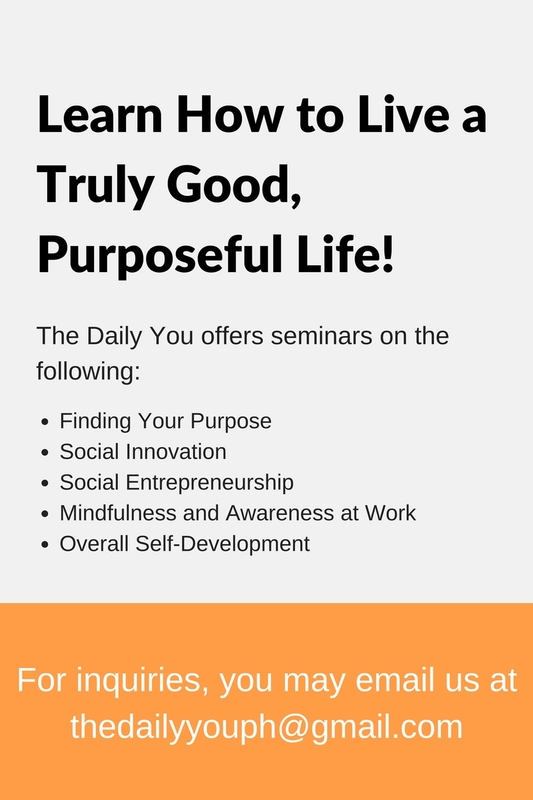 Aside from her column Ink Stains, which talks about life issues concerning the self and dealing with others, she also conducts workshops on Dream Boarding and Life Mapping, Character-Focused Personality Development, and Marketing Communications. Concurrently, Lali is the Chief Vagabond of Stamps Travel & Tours, a travel company that brings people to Philippine and international destinations, pilgrimages, and soul searching tours. Follow Lali on Instagram and Twitter at @LalissaSingson. Tags: love, real love, relationships, Service, true service, understanding. Bookmark the permalink.